I borrowed this phrase from Jon Bentley, who in turn was quoting William Strunk Jr.’s observation in Elements of Style. Jon says that this is true in both English and Programming. In this chapter titled The Most Beautiful Code I never wrote, from the book Beautiful Code, Jon shows how you can do more and more with less and less. He takes a quicksort program in C and through a series of steps, makes it smaller and better. Yes. Vigorous writing is concise. It is a skill I am still working on. The concept of third places is a new one to me. Thanks to Konard for blogging about Classrooms as Third Places and providing some useful links. Third Places Oldenburg suggests that beer gardens, main streets, pubs, cafes, coffeehouses, post offices, and other third places are the heart of a community’s social vitality and the foundation of a functioning democracy. They promote social equality by leveling the status of guests, provide a setting for grassroots politics, create habits of public association, and offer psychological support to individuals and communities. While both Konrad and Oldenburg identify physical spaces as third places, I wonder whether a virtual spaces (blogosphere, facebook like social communities) can be considered third places too? They definitely “host the regular, voluntary, informal, and happily anticipated gatherings”. Each week you should read the assigned material and blog answers to the questions for the week, or simply complete assignments for weeks when there are no readings or questions. Your blogging should demonstrate your understanding of the assigned reading material and should include original thoughts and synthesis. Don’t just summarize readings. Making connections between the week’s readings and either previous readings or previous blogging (of your own or of other students!) is strongly encouraged. The site contains a lot of information if you are interested in this space. This is an old story – more than 5 years old. But it showed up in a forum, I watch called TeachAndLearnOnline group. Bill Kerr relates the India hole in the wall effort about 5 years ago to support the reason why empowering kids with computers (like OLPC) may work. Here is the original Hole in the Wall link. Here is the digital vocabulary the kids made up when they started using the computer without being taught. Here is a link to the eight minute video posted by James Neil. I just discovered Wiki Mind Map on LifeHacker. I tried a couple of maps. It is a cool way to visually browse information from Wikipedia. It may be a nice tool for presenting information, as well. 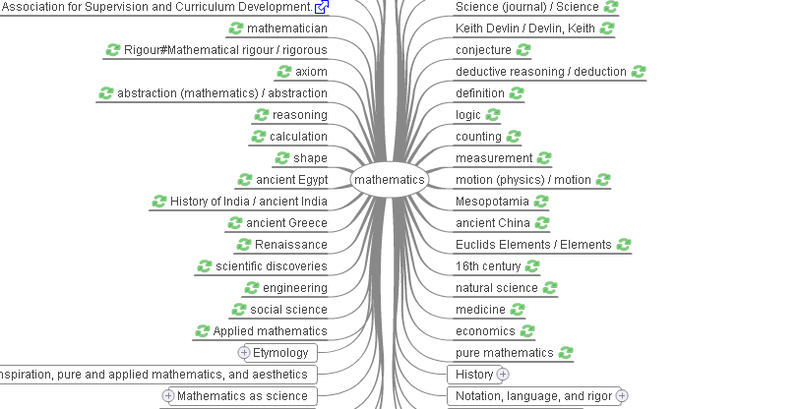 You can click on the link and see the new mindmap of the topic or head over to the wikipedia page. Links are specially marked. 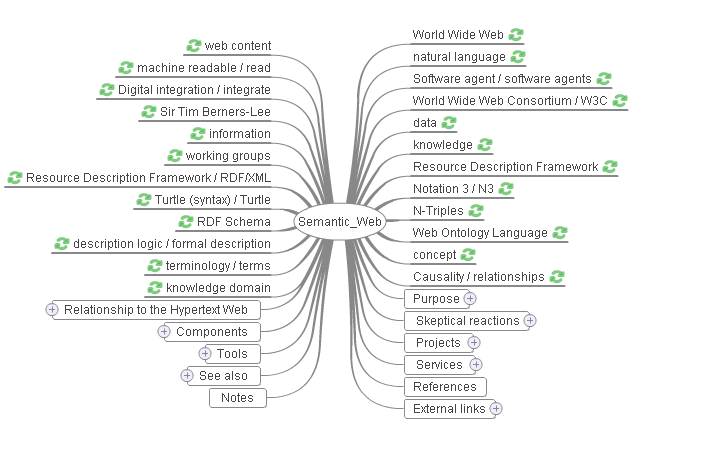 Here is a map of The Semantic Web .It takes a bit of time to draw but worth the wait. And another map of Mathematics. I just clipped part of it for display here. It interesting to keep an eye on TIOBE’s programming language trends. The position of the language is as interesting as the movement of languages up and down the rank. Lua, D and Ruby moved up, big jumps. You can see the top 20 list here. Here is how the index is computed. Here is an excerpt from TIOBE’s July News Flash. This month, it looks like the month of game programming languages with a functional nature. Lua, particularly known as the implementation language of “World of Warcraft”, has entered the top 20. Now that all the hype around Ruby is cooling down, it seems to be time for a new scripting language. Lua is dynamically typed, with a very small but extendable language definition. It has borrowed a lot of features from the functional world. At the same time Xbox compatible language F# entered the top 50. Everybody expected Scala (currently at #55) or Groovy (#54) to hit the top 50 this month, but F# was to one that really made it. F# is just like Lua a functional-like language. Although F# is still a Research project from Microsoft, it gains a lot of attention already. I have heard mentions of Scala, but not D. Both may be worth checking out. I am surprised that Haskell does not figure in the list of Top-20 and FoxPro is still hanging in there. PHP seems to be going down a bit. I am surprised to see that since some of the most scalable web applications – MediaWiki (which powers Wikipedia), WordPress are written using PHP. So what metrics would you use to pick a language? It depends on what you want to do. If it is jobs, then Java is a good bet for a while. If you want to build rapid web applications then Python, PHP and Ruby are definitely the ones to consider (even though Python/Ruby are very different from PHP). For Windows developers, obviously C# is the language of choice. Game developers seem to like Lua, C++ and Python over other languages. Even though TIOBE does not consider markup languages in their listing of programming languages, I think XML and RDF will be important ones to learn.